If you have ever tried to slow down a standard video clip you’ll have noticed the movie gets choppy and stutters, that’s a common problem due to the frame rate staying the same despite the video slowing down. The solution for older iPhone and iPad devices to this is to shoot a video at higher frames-per-second, which you can now do with the help of an awesome free app called SloPro. Remember, new iPhone models can record slow motion video natively and thus they do not require this app. But if you have an older iOS device, read on! SloPro shoots video at 60FPS on the iPhone 4S, twice that of the standard video capture frame rate, allowing you to create smooth and beautiful slow motion videos effortlessly. 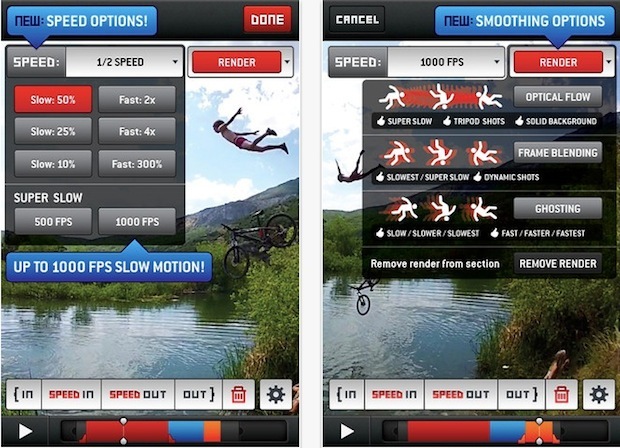 It’s an absolute cinch to use and includes some basic video editing tools to edit your slow motion videos on the fly. You can add various rendering effects, slow video down dramatically, and even speed video up. This is an excellent app for all seasons and activities, but active individuals and sports fans in particular should get an extra kick out of it. Whether you’re capturing athletics on a field or going for that classic slow-motion riding effect you see in just about any surfing or skiing video, SloPro delivers. The app is best on an iPhone 4S because it has the most capable hardware to handle shooting in 60FPS, and though the app works on other iOS gear you won’t find it to be as fluid or smooth. That’s really the main downside of the app, but if you have a 4S or you plan on upgrading to the newest iPhone when it comes out later this year, this will be an outstanding app for your arsenal. Even with the hardware limitations it’s a fun app, and for the price of free it’s hard to beat. There is a paid $4 in-app purchase if you want to ditch the video watermarking, but otherwise the free version is full featured. You’ll definitely want to add a separate audio track, since the audio also gets slowed down and ends up sounding like a dying frog. Kind of a disappointment that iPad 3 won’t shoot 60FPS considering it’s better hardware than what is in iPhone 4S… I feel like the iPad 3rd gen is underpowered. Whoa this app is very cool, I’m impressed! Thanks! I bought this app a few months ago but it does not have the options shown in the screenshots here and there is no upgrade available so I’m not sure what’s up with this. MYbe this guy has a beta? I gave this a try and the results are not even close to the demo videos. The background of video is distorted, and the item in focus gets deformed a bit. This really felt like a gimmick. A good attempt though! This app is actually pretty good! Thought that the slow motion would drop quality, but videos still turned out great! Reminds me of the slomoguys from YouTube.